MISC Berhad, an energy-related maritime solutions and services provider has held the naming and delivery ceremony of its new LNG carrier, Seri Cenderawasih. The 150,200 CBM Liquefied Natural Gas (LNG) carrier is the second in a series of five MOSS-Type LNG carriers ordered from Hyundai Heavy Industries Co., Ltd. (HHI) by MISC. Upon their delivery, these new LNG Carriers will be on a long-term charter to PETRONAS. 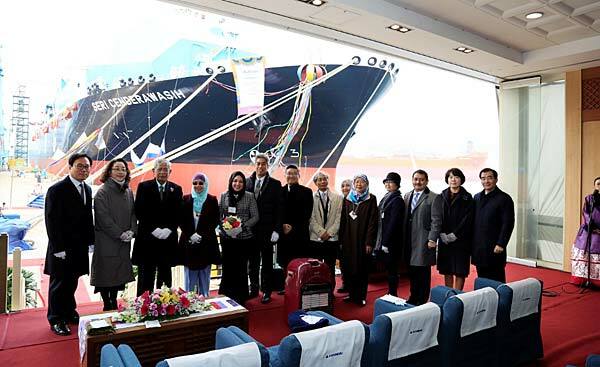 The naming ceremony was graced by the presence of Encik Md Arif Mahmood, Executive Vice President & Chief Executive Officer, Downstream Business of PETRONAS and was officiated by his wife and the vessel’s Lady Sponsor, Puan Nazrin Aneeza Nazaruddin at the HHI Shipyard in Ulsan, South Korea. Seri Cenderawasih, along with its sister vessel, Seri Camellia that was launched last year in September, will be part of the new generation of the Seri C Class LNG fleet of MOSS-Type vessels. The MOSS-Type newbuilds are part of MISC’s long term fleet expansion programme to cater to the energy transportation needs of PETRONAS. They have been designed for worldwide trading capability to enable them to call at all major LNG terminals in the world. These new vessels provide a more robust and superior cargo containment system and ensure a higher degree of operational flexibility for MISC to operate in harsh meteorological conditions. The new generation of LNG carriers incorporate state-of-the art technologies in various forms including the Integrated Hull Structure (IHS) with four spherical tanks shielded by the continuous cover, which improves the overall structural strength of the hull. Additional green technology features adopted for these new carriers include energy efficiency, emissions reductions, biodiversity management and end-of-life disposal. These features also include the installation of the Selective Catalytic Reduction (SCR) system for the diesel generator to comply with the latest IMO Tier III requirement and the Ozone Ballast Water Treatment System. The carriers will be powered by an Ultra Stream Turbine (UST) plant, and installed with pre-swirl duct and Propeller Boss Cap Fin (PBCF).